It seems like I rip off the pages of my daily calendar at an alarmingly rate. It is already March. Days continue to turn into night, and the sun returns with a beckoning whisper of new hope. New beginnings. New identities starting to form. March is the whisper gently saying, “you’ve almost made it!” You can start thinking about bravely poking your new shoots through the dirt and soil that has kept you safe, and well, frozen. Let the sun thaw you into something green. I’ve been thinking a lot about the phrase, “refiner’s fire” mentioned in the Bible. How God takes all those gnarly parts of who you are no longer meant to be, and literally burns them away. The burning is a painful process, right, but beauty remains. I was talking with my mom about change and she reminded me that every cell in your body replenishes itself at least once a year, of course, if not more. Every single cell that makes up who you are in the world dies and begins again to allow for growth. How do you die and begin again? Is it a choice for a new habit to form, a new friendship to take root, a new place of being to spend your days? I’m going through some changes, and I will have a full update soon, but for now, am thinking of the refining process and allowing myself to celebrate amidst those fiery flames that lead to new, great and wonderful ways of experiencing our world. So, here are some things that I consider to be my self-care lately. Judge as you may – the way we spend our time is often up for scrutiny isn’t it? 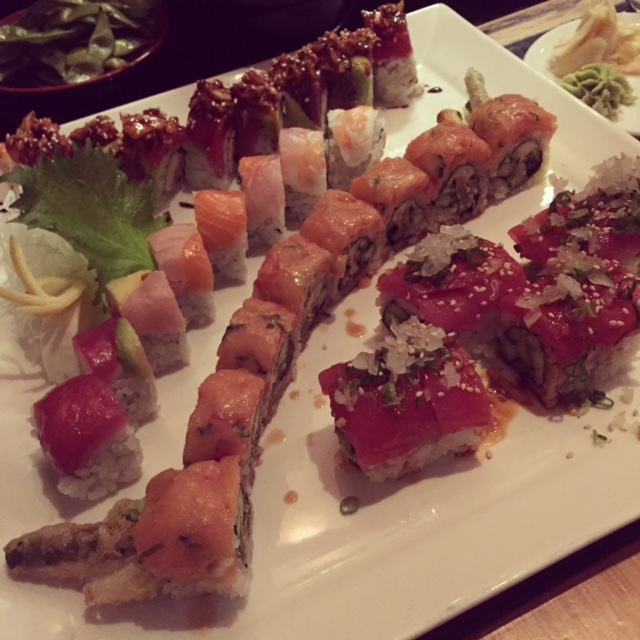 Sushi – There is a great restaurant in Boulder that Dylan and I often frequent for a splurge night out. Hapa Sushi is delicious, adventurous, and sparks the senses. I fear my tastes in sushi may be evolving. We wanted the fancier, more delicate rolls that are crafted with an immense amount of intentional flavor blending built in. I drove down to Boulder Friday night, and we thoroughly enjoyed a culinary experience. We talked, really talked, about our hopes and our perceptions of where we are at in this stage of life. Quality time and beautifully crafted raw fish made my heart happy. Scrapbooking – When I was a junior and senior in high school, I participated in the International Baccalaureate program. It’s a wonder I graduated. I still can’t spell that word without the help of spell check. Can I get an I.B. holler? One of my higher level classes was HL Art. In our creation of our pieces it was a primary responsibility to maintain a research workbook. Ah, the dreaded research workbook. We were supposed to document and identify every stage of the creative process for our artistic inspiration. This included pictures, techniques, supplies, articles and insights that led us to our finalized masterpiece. The books were a lot of work to maintain. I, being a collage creator and journaling documenter, loved this homework and have adapted the research workbook style of documentation into my life. That, and my love for rubrics, but that is something different altogether. I glue things into my personal journal, draw, sketch, capture readings and words that bring me up to speed with who I am today. 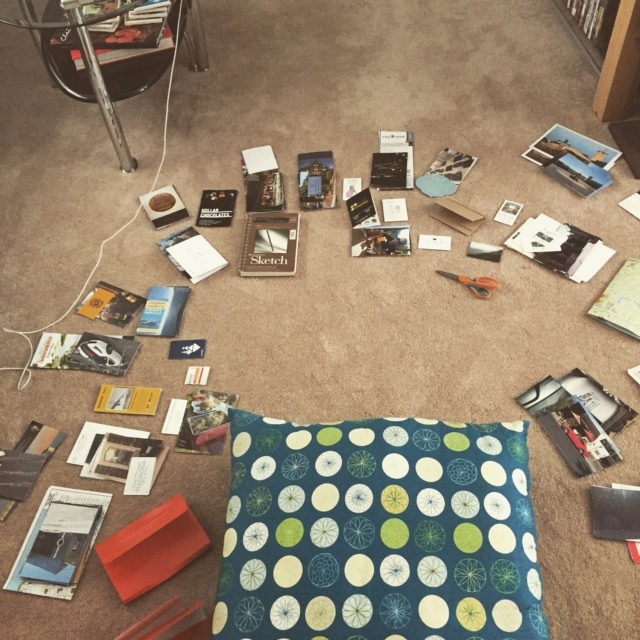 So, after our honeymoon and the realization that we took over 400 photos, I had the idea to create a research workbook style scrapbook that would document the start of our official “us-ness”. This weekend, Dylan was brewing beer and I got to work organizing our photos and our memorabilia from our trip, and set to work to craft our story of how our marriage started out. All I could think of was my professor in college who taught my “Families in Society” class as she repeatedly said, “Women are primarily responsible for the documentation of family history. This involves Christmas Cards, scrapbooks, kid’s memories boxes.” Well yes, Professor, I’m taking on this work diligently. This project is going to take me longer than I originally anticipated, but it’s off to a great start. I think my forearms are actually sore from using the glue stick and my fancy paper cutter. Sore. I know, it’s pathetic. There is beauty in documenting my life, and in my efforts to do so creatively. Snow Shoes – Sierra Trading Post was having a sale so I bought some new snow shoes. I’ve only ever tried this hobby once, borrowing the much needed gear from a co-worker. In efforts to invest in new interests, I now have my very own pair. They are pink, and they have stars on the bottom. They are fabulously girly. They also give me reason to desire the snow, and I hope that I can have a few adventures tromping around in that white powder before it melts for the year. Cheers to the beauty in trying new things, in investing in interests that will allow you to expand, and to pink! If you want to go on a snow shoeing adventure, please, please invite me along! Books – Beautiful, Beautiful Books – I continue to read, and love my time with words on tangible pages. I just finished “Yes, Chef”, by Marcus Samuelsson, and was tantalized with his way of mixing our connections to food and culture to his own story. I’ve got a stack of new books on my coffee table and I just scheduled a “Book Swap” party with some of my favorite women in town. Stories are important. We need to document them and we need to explore them. At least, I do. As winter begins to thaw into spring, where are you growing? What are you doing for self-care and how are your very cells regenerating into something new? Do you find the process to be beautiful, or painful, or both?